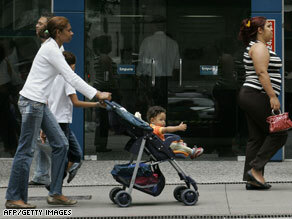 LONDON, England (CNN) -- Parents who choose a stroller that seats their baby facing away from them could risk long-term development problems in their children, according to a study published Friday. Parents are less likely to interact with children in forward-facing strollers. The research found that children not facing the person pushing them were significantly less likely to talk, laugh and interact with their parents. Based on a study of 2,722 parents and children, the study by Dundee University's School of Psychology calls into question the designs of many of the world's most popular baby strollers. "Our experimental study showed that, simply by turning the buggy around, parents' rate of talking to their baby doubled," said developmental psychologist Suzanne Zeedyk, who led the research. Parents using face-to-face strollers were more likely to talk to their children, who were less likely to exhibit signs of stress, the study said. "Our data suggests that for many babies today, life in a buggy is emotionally impoverished and possibly stressful," Zeedyk said. "Stressed babies grow into anxious adults." The study found that 62 percent of all children observed traveled in forward-facing prams. For children between the ages of one and two, the figure was 86 percent. UK child education campaigners the Sutton Trust say the study highlights the need for manufacturers to rethink the designs of strollers.